If you aren’t familiar with this series, But Is It Lit aims to report on fun, local(ish) phenomena/ephemera and ask of it the age old question: is it literature? It’s basically a hill of giant rocks. The hike is as fun and as tough as you want it to be, as there are an endless number of ways to tackle the hill. 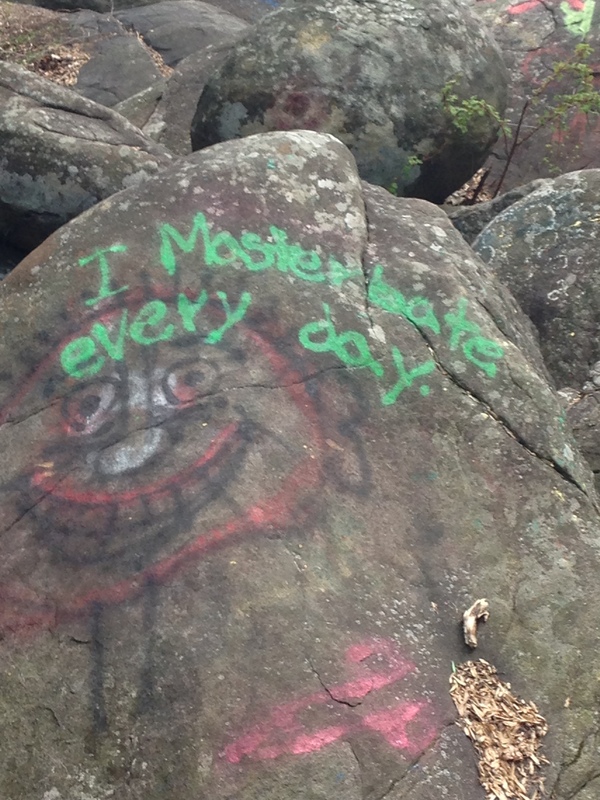 As we were exploring the rock scramble, colloquially known as the Devil’s Potato Patch, we noticed graffiti-art covering the boulders. We thought we’d be spending the day in nature, where the only literature we’d encounter would be the notes we might scrawl in our journals once we reached the top. …from 17 years ago. But, forest dwellers and passing vagrants might not be aware of some of these things yet, so it serves a purpose. 2. The messages spray-painted on the rocks are like tweets. Gross oversharing and in-your-face humor work to surprise the reader. Laughter is a common reaction. These short, probably true, jokes are much like the 140-character snapshots we get on a daily basis from writers and humorists alike. They are in our feeds; they are here on our rocks. “The first soap was made from the ashes of fallen heroes, like the first monkeys shot into space.” Chuck Palahniuk. 4. The messages spray-painted on the rocks are challenging your paradigms about not only what literature is, but where it can be found. So, keep your eyes open and if you see something that might be literature POINT IT OUT (and then email us).